Asian Export Machine Cracks Wide Open! It’s not just Chinese manufacturers that are struggling. It is also Japan, South Korea, and Taiwan. In other words, the Asian export machine has cracked wide open. 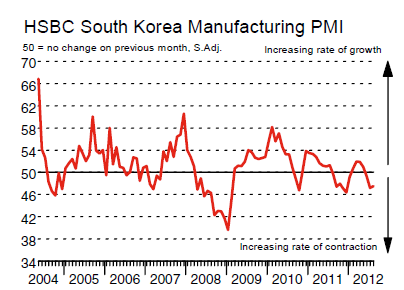 The Markit South Korea Manufacturing PMI® shows Production Falls at Fastest Rate in Eight Months. Purchasing activity at manufacturing firms in South Korea decreased for the third successive month in August. The rate of contraction was solid, but eased from that recorded in July. The Markit Taiwan Manufacturing PMI™ shows Output contracts at steepest pace in the year-to-date. Weaker national and international demand led to a third successive fall in output at manufacturing firms in Taiwan. The pace of the latest contraction was steep and the fastest since December 2011. New orders and new export business both declined, extending the current sequence of contraction to three months. According to panellists, the slowdown in the wider economy resulted in weaker demand for manufactured goods. In line with falling production, backlogs of work decreased for the third month running. Furthermore, the pace of contraction was the sharpest in 2012 so far. 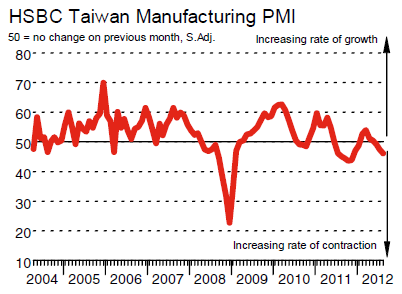 Input prices at Taiwanese manufacturing firms fell for the fourth consecutive month in August. Although marked, the pace of decrease was slower than that recorded in July. Panellists reported that input costs fell in line with decreasing metal and raw material prices. Moreover, it was mentioned that weaker demand also contributed to the latest decline. In line with input costs, charges fell at a solid rate as manufacturers attempted to maintain competitiveness and attract new business, it was reported. In the South Korea report it was interesting to see the line “respondents stated that the global recession had adversely affected production”. I certainly believe the global economy is in recession and stated so on July 11 in Case for US and Global Recession Right Here, Right Now. Global GDP will struggle to rise 1% and it may even contract. Even 2% is in recession territory, and that is a given.